We are camped along the river on the Naval Station in Mayport, FL. This is a great location if you want to be at the ocean and watch the military and commercial traffic as it goes by. It also a good stop on our way to the Good Sam Rally in Daytona. We have found many times during our travels that when we stop in a location without any special reason other than it is a good place to stop, we discover that there is a special event that we did not know about taking place there. Today was one of those occasions. It started when I noticed that all four of the powerful Navy tractor tugs were leaving the harbor and waiting in the river entrance channel. I grabbed the camera and joined others close to the waterfront. I discovered that very shortly the USS Enterprise (CVN-65) was about to enter the harbor. Now this would be a big thrill for me at any time, but this was a special arrival, as it was part of her last voyage as a commissioned US Navy vessel. She is the longest naval vessel in the world and the second oldest US Naval vessel in service. The three masted Frigate USS Constitution being the oldest. Sadly, she is destined for the scrap pile at the end of her service. When decommissioned she will have served over 51 years. The history of the USS Enterprise includes much of our naval activities for the last fifty years. It was a real privilege to observe part of her last voyage into history. 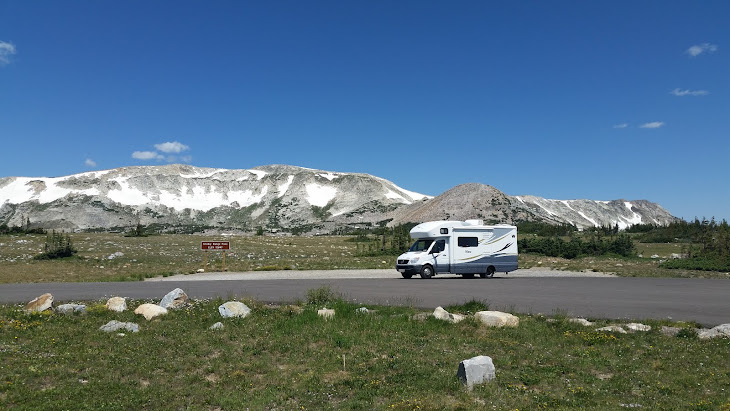 We continue to adjust to a life away from full time RV travel that we enjoyed so much. That is not to say that we are not enjoying our new normal, for we are. Never the less, there is still some adjustments that need to be made. Since our last RV trip we have engaged in any number of activities for our new normal. First and foremost, we have had lots of time to enjoy our granddaughter, Victoria. I suppose there is some downside to spending time with these small and energetic creatures, for me that is mostly realizing that I am getting old and it is hard to keep up with her! For the rest , there is lots of fun, like introducing her to Santa Claus, Halloween outings, getting her to wash my car. Perhaps the best of all is just hanging out with someone who finds everything new and interesting. Then there is the true reminders that I am living in a sticks and bricks. Nothing says permanent more than having to put together a big grill that has a 25 year guarantee. If only, I could get the same warranty for myself. Another new project is making our own doggie treats without any additives, luckily Halley seems to enjoy them. Part of our duties for the RV club we have recently joined, was to find an RV park for our monthly campout. We found a nice, new place in Freeport. It is close to the town of Seaside, which was one of the first towns built in the style of New Urbanism. Every home is colorful and there is a varied style to be seen from many different ages of design. What makes it most notable is the fact that the movie "The Truman Show" was set in the village. You can still recognize scenes from the movie from just walking around the town. I have no intention of getting into politics, but being in one place allowed us to plan to attend the Romney/Ryan rally in Pensacola, FL yesterday. I will only say that this is the first political rally I have attended in 65 years! Tomorrow we pull the RV out of storage for a week trip including the Good Sam rally at the Daytona Speedway. This past weekend we traveled to Foley. AL with our local Winnebago club. We stayed at the Southwind Campground located halfway between Foley and Fairhope Al. Both towns are best known for their interest in attracting tourists. The campground has full hookups in most level grass with a section dedicated to rallies and other group gatherings. It is reasonably priced and has access to lots of restaurants and shopping. Just a few miles down the road you have the beach and all its attractions. On the way to the campground, we made a stop at the outlet mall to give our fair share to the economy. Club gatherings are probably the same everywhere, but we always find some unique happenings at each one. This time we were next to a member who has his own winery and likes to share his accomplishments. He has some fine tasting wines! Also, at this outing, one of the members was celebrating his 84 birthday! It was a small group this time, so by a twist of fate we happened to be the youngest members in attendance by roughly ten years. That does not happen to us much these days. The town of Fairhope is considered to be one of the more quaint in the area. It is now mostly inhabited by tourist type shops and for some reason an extraordinary amount of hairdressing establishments. There were notices in many storefronts inviting all to attend a charity Halloween event, where the proceeds would go to ensure that seniors would be able to have their hair done for the holidays. At first I found this rather strange, but then remembered the abundance of hair dressers in town and the light bulb came on. It was a very nice day to walk around and we even found a great Christmas present for our granddaughter Victoria. We went to a town park on the water and enjoyed lunch and a stroll along the bay with Mobile in the far distance. Our next trip will be to the Good Sam Rally in Daytona Beach. This should be a bit more energetic. The rest of the Louisiana Rally included a tour visiting a German heritage museum and a farm that grows rice and crayfish. The German community was settled in the Rayne area of Louisiana in the early 1800's and remains an active and tight community. They currently have around 125 families with community life centering around their Catholic Church. We had a private tour of the museum. It was interesting to listen to this oral history. Within the museum they have a couple of interesting ways of following the family trees of the residents. I found the photographic method to be very effective. Also displayed in the museum were many family treasures. Next on the trip was a stop at Kelly's Landing where rice and crayfish are the crops. Now I would have thought from both the name and the crayfish farming that we would end up near the water. I was completely wrong. We traveled deeper into the farm land where we started passing all these fields that were surrounded by what looked like dikes. Upon arrival we were welcomed by Mr. Kelly and given a brief tour of his large toy collection before we were seated for lunch. Mr. Kelly was also the cook and the entertainment for lunch. He proved to be a very funny storyteller and regaled us with many stories of his life and how he got started in the farming business. It turns out crayfish are often grown in these fields along with the rice crop. The very short version is that they first plant the rice crop , flood the fields and allow the rice to grow, then seed the area with bags of crayfish. When the rice crop is ready, they drain the fields and harvest the crop. Then the field is flooded again and over the next several months the crayfish grow eating the left over rice stalks and are eventually harvested to end up on seafood restaurant menus across the world. To say that Mr. Kelly is a John Deere fan is a huge understatement. We enjoyed his stories and touring his personal collection for well over an hour. The rally was the usual collection of eating, talking and having fun. The only negative note was our bean bag team not only lost but made Col Custer look like a winner at the little big horn. Now Rayne is the Frog capital of the world and they take this title very seriously. The local Lions Club visited the rally with their frog queens to demonstrate the prowess of some of the champion frogs. The pictures are a bit blurry, but in my defense those big guys were moving fast, as they each tried to make the longest jump. I am one of those people who have never liked putting bumper stickers on my vehicles, no matter how excited I may be about a cause or tourist attraction. I just do no get it. However, we did have one coach at our rally that clearly had no problem with stickers. Since the message seemed determined, I assume he was not just covering up a bad paint job!